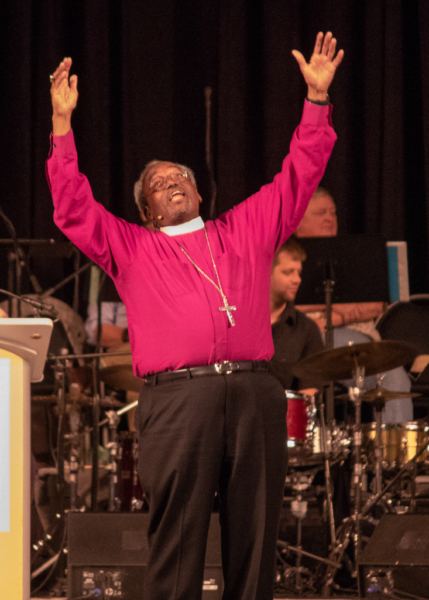 [Episcopal News Service – Austin, Texas] Presiding Bishop Michael Curry brought a rousing “God is love and gives life” message to Episcopalians and others gathered here during a revival, to standing ovation after standing ovation every time he told the crowd to live. In John 21, the risen Jesus who ask Peter three times, “Do you love me?” Jesus asks Peter the question for every time Peter denied knowing Jesus the night before his crucifixion. Through his questions, he demonstrated the way of love. “God is love. And guess what, that’s the reason we are here,” he said. 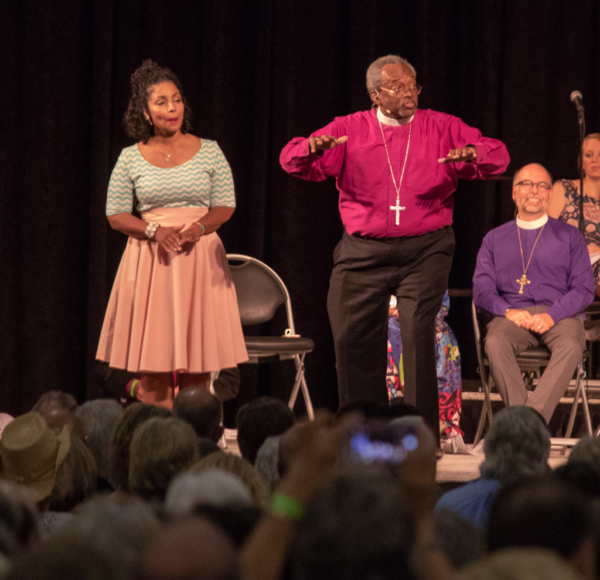 The presiding bishop preached for close to 45 minutes in English and Spanish through an interpreter at the July 7 revival at the Palmer Center. Buses – 15 departing the JW Marriott and 16 departing the Austin Convention Center – making two trips transported some 2,000 people to the Palmer Center. The total crowd estimate was closer to 2,500. In addition, 26,747 individual viewers took part in some or all of the revival service online, and the revival video showed up on the Facebook feeds of 79,149 users. One has to lay down selfishness, which is akin to sin, in order to follow Jesus, Curry said. “The key to following Jesus, the key to being his disciple, the key to life is love, is love, is love, it’s love. “The older I get, the more I am convinced that we waste a lot of time in life on stuff that doesn’t give life. And, some of that’s human; we’re human … but at the end of the day, we’ve got to live, we’ve got to live in world where little children are not separated from their parents at our borders,” he said to rousing, sustained applause. The text of the presiding bishop’s sermon is available here. 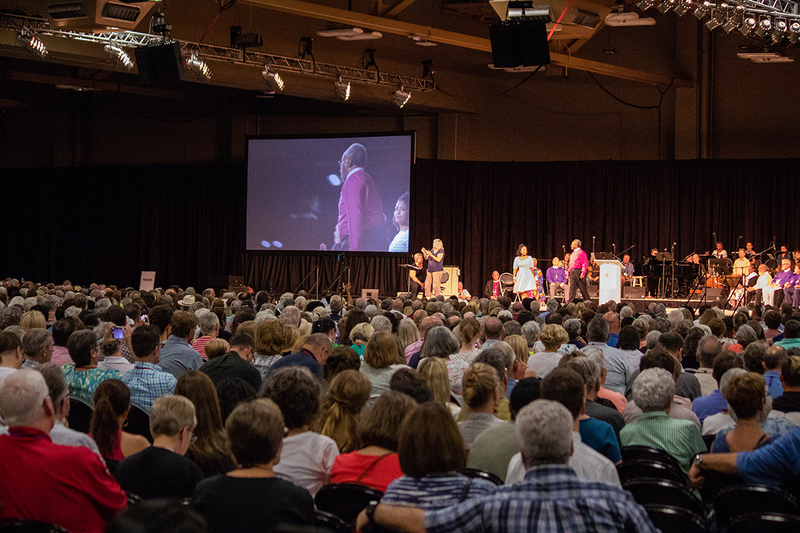 The 79th General Convention is underway nearby at the Austin Convention Center through July 13 in the Diocese of Texas. “Lord, send a revival,” said Texas Bishop Suffragan Jeff Fisher in the service’s opening acclamation. “And let it begin in me,” roared the crowd in response. Evita Kristlock was in the very last row singing and clapping along to the warm-up music as the main event was about to get underway. “I used to be a youth coordinator, so EYE is quite like this,” she said. Kristlock is a lay leader who worships at Cathedral of St. John the Evangelist in Spokane, Washington. She was joined by other members of the Diocese of Spokane, all wearing purple shirts with the message “Creative Compelling Witness” on the back. They weren’t the only ones singing and clapping, as the center filled with raucous sound. The single word “Revival” was displayed on giant screens to the left and right of the stage. “Is anybody here looking for a revival?” the praise band sang from the stage as thousands cheered their approval, most of them on their feet. Immediately before Curry began preaching, Sandra Montes of the Diocese of Texas brought down the house with “Montaña.” “Esa montaña se movera,” or “the mountain will move,” she sang. “Let the whole church say amen,” said Curry, as he prepared to preach his sermon, joking that it’s hard to preach when he was the only thing standing between the crowd and a barbecue. Following the revival, the Diocese of Texas hosted a Texas-style barbecue. The crowd, however, didn’t move for the doors until Curry gave them the blessing and dismissed it. The energy remained high following the revival, as people made their way to the barbecue. “It was great, all the people, the presence of the Holy Spirit, the invitation to love and to live, and to look at what really living and really loving look like. Compassion, hope, realizing that there’s nothing with God that we can’t do,” said the Rev. Sandye Wilson, rector of Church of St. Andrew and Holy Communion in South Orange, New Jersey, in the Diocese of Newark. Wilson, who has been a deputy 12 times and is former member of Executive Council, said she is helping at the Union of Black Episcopalians and Church Pension Group booths in the convention’s Exhibit Hall. “It was awesome. It was fantastic,” Stefan Schuster said after the revival. He and his wife, Periwinkle, are members of St. George Episcopal Church in Austin and have volunteered at General Convention through the Diocese of Texas. It has been a great experience meeting people from all over the world, Schuster said, and he has been impressed by the Episcopal Church’s diversity and spirit of welcome. Following the sermon, a dozen prayer stations catering to English, Spanish and French speakers were opened so that people could open their hearts and make their prayers known. Dixie Roberts Junk of Kansas City, Kansas, was among the revival-goers who prayed with clergy at the stations set up along the outer walls of the revival space. This wasn’t her first Curry-led revival — she also attended the one held last year in the Diocese of West Missouri — but there was something special about this revival at General Convention, she said, from the singing and music to Curry’s uplifting sermon. “There’s always something to take back that’s just the richness of our church,” she said. Curry hosted his first revival in February 2017 in Pittsburgh, and has since held ones in Kansas City, Stockton, California, Waverly, Georgia, and San Pedro Sula, Honduras. The next revival is scheduled for Western Massachusetts in October. The revivals are a dedicated series of gatherings that combine inspiring worship, compelling teaching, honest faith-sharing, intensified prayer, and some form of engagement with the mission of God – all for the sake of the spiritual renewal and transformation of people and of society. Video of the entire Austin revival, which ran about two and a half hours, can be viewed on demand here. — Lynette Wilson is a reporter and managing editor of Episcopal News Service. David Paulsen is an editor and reporter for ENS. Remove theology, liturgy, history, tradition, reason, the depth of God’s revelation through the Prophets and Christ’s completed work on the cross and substitute it with an empty, charismatic, substance free, light weight and ill defined “movement” and you have the substance, or lack thereof, of the PB’s remarks. There is a time and place for everything and this night was a night to celebrate. Instead of criticizing, think for a minute of the joy of being together as God’s children. It is still okay to be in awe of that mere fact without anything else. You are on target. Too bad, but it is the case. Can understand PJ’s rem and remarks. But TEC can have it all. We are not an “either or” church, but a “both and” church. The problems come when we ask, “how?” The answer, of course, is by sharing (and always becoming) God’s Good News revealed in Jesus Christ. Very wise words. Thank you Reverend Hargis. God’s good news revealed in Jesus is that Jesus was born as the son of God the Father, he died and was then resurrected. Through this is our path to salvation encapsulated in the Eucharist. Christianity is about personal salvation. That is the primary concern of the Gospels. Social justice is “down the line” in consideration. Certainly our “works” towards and with our neighbors are important; certainly you will know the tree by its fruits. But, for a Christian, all of this is very much of secondary consideration if not set within the theology of Jesus as Christ. One of the problems with the “both/and” approach is when we face contradictions. In a contradiction both “sides” cannot be true/correct/right. Thus, “inclusiveness” has its limitations IF the truth is to be sought. In some cases, and often important cases, we just cannot have it both ways. Can understand PJ’s remarks. But TEC can have it all. We are not an “either or” church, but a “both and” church. The problems come when we ask, “how?” The answer, of course, is by sharing (and always becoming) God’s Good News revealed in Jesus Christ. I must admit that I started watching with much trepidation, and I skipped most of the music before and after, but I came away quite surprised. I haven’t been to a revival in more than 50 years and I couldn’t imagine one put on by TEC. I was enraptured. Our PB surprises me over and over again with how he can pull off what he does. I believe we are very blessed to have him as our primate. Also, as a missioner working with Latinos for 13 years, I have NEVER experienced such delight in a translator. At my age, I well remember tent revivals, the standing, shouting, clapping, etc. there was always a great deal of emotion, but this faded away within days after leaving the tent. On the other hand, there was very little theological substance other than such as “follow Jesus” and that usually meant doing what the preacher was saying to do. All of this eventually led me to join the Episcopal Church. Now “things” appear to have come back full circle. After hearing Michael Curry’s recorded address about “love and live,” PJ Cabbiness, have you checked for a pulse lately? How have your more lofty requirements benefited anyone but you, alone? Someday you may be the last person on the island, or in the Episcopal Church, given what your remarks reflect. And then, what? Despite our differences, I will not insult you and I respect your right to your opinion. And yes, I have a pulse. I do not know you and so I do not know if you would claim that we all ought to love and accept everyone. You may; you may not. Some do. some do not. But, for those who do make such claims of universal love and acceptance, I find such remarks as yours to Cabbiness at best odd. If one person does not agree with another, certainly that can be brought to light. But, that “I” disagree with “you” says NOTHING about who is correct and who is not. In such cases, and they are many, we ought to be a bit more humble seriously realizing that “I” might be wrong, seriously listening to what the other has to say, and only then entering into a conversation which might enlighten both sides of the dispute. We ought not to begin with verbal jabs (Lord known, I realize the temptation) for that kills possible conversation and mutual enlightenment. And such jabs certainly goes against a universal principle of love and acceptance. I am absolutely delighted to have started a conversation, all be it with less than lovingly chosen words. I often push back when I see someone “raining on another’s parade.” While not only raining on Michael Curry’s address, rain fell on the many of us who appreciated it. Opening this exchange with: “…you have the substance, or lack thereof, of the PB’s remarks,” I, true to my calling, push back. PJ, I apologize for using insulting words, but not for challenging your assessment of Michael Curry’s remarks. The “substance” is between the lines, of that you can be certain. The message is always “between the lines.” Our Presiding Bishop knows and preaches accordingly. Just curious — are you one of those who say we ought love and include everyone no matter what? Well, the remarks suggests just how hard it is to practice love. How I meet God may not be how others do. Surely no one of us can claim to have the one and only answer. Let us walk in love and try to practice love, so that we may live in peace with each other. I must admit that I prefer a more restrained, cerebral style of preaching. While I understand that many find the PB entertaining (and I do also in a negative way), I kind of find his style to be embarrassing. An Episcopal revival? That’s not the Episcopal Church I grew up in and respect for its intellectual underpinnings and style, even though I became an atheist long ago. Hooting and hollering at revivals is for Baptists. An Episcopal revival? That’s not the Episcopal Church I grew up in and respect for its intellectual underpinnings and style, even though I became an atheist long ago. Hooting and hollering at revivals is for buffoonish Baptists. God is Love and gives life.Though simple words the message is clear. Emptying churches need reviving of the spirit. The last revision process was, in good part, sneaky and under the table. If and when there is another revision let us have this happen nor be driven by contemporary political issues.